To help you, file your Income tax return online, the tax department provides both utilities – online and offline. But to fill in details, in each and every respective field mandatory of the different tax forms, a taxpayer needs the assistance of a professional tax expert. While for business organizations, preparation of Income tax return online becomes even more complex, as it requires an accounting of each and every transaction to be considered while calculating the overall taxable income of the business. Thus, they require a smart tax filing solution for their business which can either be an automated software package or an in-house tax expert. Tax Knowledge: To file all required and appropriate fields of tax forms, it is necessary for the taxpayer to know all respective sections and situations if he chooses to file through a pre-coded accounting software. While no such knowledge is required, when filling through a hired accountant. Confidentiality: If a degree of confidentiality is required to be maintained and the taxpayer does not want the business information to reach to outside sources, it may choose a computerized tax reporting option than hiring a tax official. Advisory: For small business units it is difficult to file tax according to the changed situation, with an old, automated and limited tax preparing software package. In such a situation, the accountant so hired shall advise in his own unique way to deal and pay taxes accordingly. He will act as an advisor in such a situation which is not possible in a pre-packaged tax filing software. Accuracy: It can be said that working off a tax preparing software is much more accurate and reliable than an accountant so hired who will manually compute for all the tax figures. With the use of software, it is easy to compute tax in a particular sequence as provided without leaving anything unnoticed. Business tip: An accountant hired to serve in-house is well expected to safeguard the business interest for new investment avenues, purchase decisions and the related tax consequences which a purchased packaged software application can’t do. Tax planning vs Tax Filling: It is obvious that the foremost need of businesses is assistance in tax planning and filing accordingly to which only an expert accountant hired could help. While a customized software application can only be optimized for multiple filings and tracking options. Thus, the accountant receives a thumbs up here too. An advice of a tax professional is something for which software can never opt. To keep up your business in this dynamic field an experienced tax professional hired can be proved as a qualifying asset. 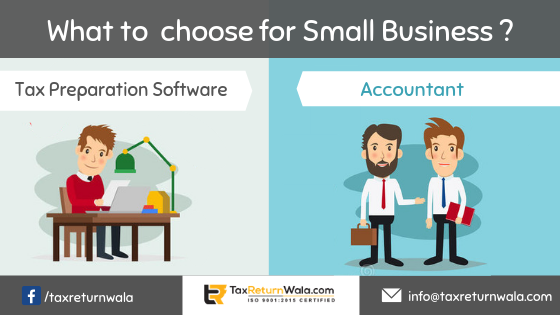 Also, choosing a tax preparing software for only some specific tax requirements can be beneficial.